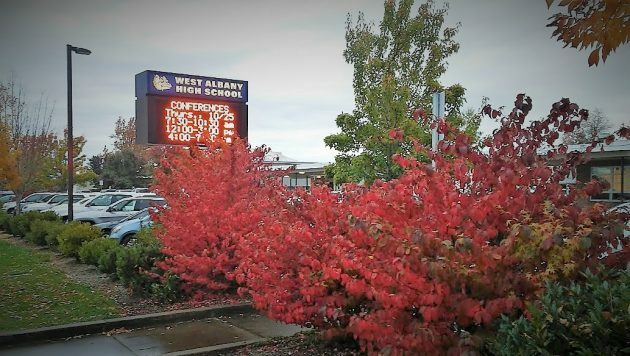 Thursday was conference day at West Albany High, where 41 percent of juniors met or exceeded standards for math in 2018. If you’re wondering why so many Oregon high school students fail to meet the standards for math, it’s because the test is hard. Very hard. At least to me, who was not that hot in integral calculus when it mattered, some 55 years ago. Amid political controversy, the state Education Department announced this week the 2018 test scores for Oregon schools. Statewide, only 33 percent of 11th-graders met the standards for math. In Albany, 28 percent of 11th-graders at South met the standards. At West, it was 41 percent, but participation in the test was less than 94.5 percent. I wondered what’s behind this. The rates for meeting the standards in English and science are much higher than for math, dramatically so at West, where they far exceed the state averages. So it can’t be that the test takers as a group are generally slow. Trying to learn more, I visited with Jon Dilbone at the school district office. 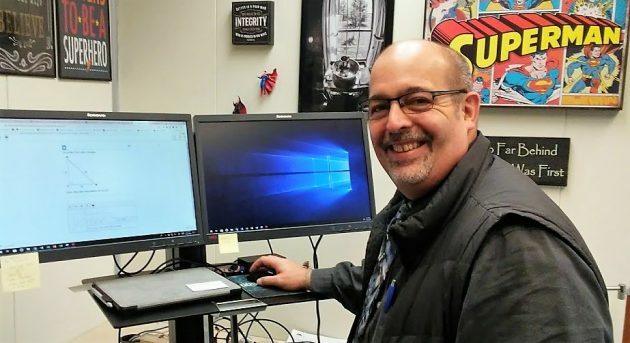 A former science teacher and middle school principal, he’s the district coordinator for applied learning, assessment, data and technology. He showed me the 26 pages of “Oregon Common Core State Standards for Mathematics” for high school. The standards, Dilbone told me, are set at a level so that students who meet them are expected to get through college with a B average. They cover the “conceptual categories” of number and quantity, algebra, functions, modeling, geometry, and statistics and probability. All of that probably makes sense, at least for a while, to students who have been skillfully instructed. But you have to wonder how some of this stuff is useful to the vast majority of high school graduates who go on to become good citizens and productive, contributing members of society. Do other states have the same standards and what are their results? If West Albany results are this much higher than south Albany how can you say this? As a parent of two students in the Albany school district, I’m not as concerned about the math curriculum as I am the blatant omissions in some very basic, necessary skills…like spelling. Remember weekly spelling tests when we were kids? Those have vanished, and the poor teachers are struggling with the aftermath of having a classroom full of third graders who can’t spell the most basic words because they were taught from kindergarten on to spell phonetically instead of memorizing the correct way to spell. I’m simply mortified at the current curriculum and it makes me wonder if this is only at the Albany level or is it statewide? I’ve taken it upon myself to try and fill in the gaps by doing spelling tests (and more) at home, but with a child in third grade, another in first, and a three-year old, it’s becoming overwhelming. I am with you on that Tai Stith. My youngest is in 6th grade now and he struggles with spelling AND penmanship. I recently learned that penmanship was dropped as something being taught when he entered schooling. No argument over spelling; spell checkers will give you correctly spelled, disastrously wrong words. I’m not convinced about penmanship. In the 1950s, I learned to write in perfect form on multi-lined paper which looked like music-score paper. I never developed a useful, attractive, and efficient (quick) cursive style of my own, gradually came to hate all cursive writing, and use only block capitals wherever I can. On the other hand, like many males of that generation, I never learned touch typing, which would have been infinitely more useful throughout my life. Cursive writing is just an anachronism, something to be pursued as an art form by those who are interested. That’s great for you that you were at least taught to write. My son wasn’t even taught proper block letter writing. He would just try to mirror what he was seeing written down. That doesn’t help with the font types are not uniform. His lettering is all over the place. He is also at a disadvantage because he learns a little slower as well. When I reference penmanship, I wasn’t just referring to cursive. It would be nice if that is taught to kids, but at the very least, basic lettering would be great too. There are people that think with our technology putting pen/pencil to paper is not necessary. But I beg to differ. As much as businesses get away from the paper trail it will always be there. Our kids need to be able to fill out forms in a legible manner. Also, if they aren’t taught cursive or script, there are scrolls and documents in our history they won’t be able to read. But I am also aware for teachers to be able to take on those subjects, it would require for them to have more time in class. However, for something like that to happen, the schools would require money to be able to pay the teachers to have more time, and that just won’t happen here. Students here are at a disadvantage compared to other states because our school year is weeks shorter than most. Oregon kids can’t learn as much in a year if they’re not in class, and that’s particularly bad in math and language. Holy cow!!!!!!!!!!!!! They are expected to know how to solve the posted problem but many can’t even make change at the store. The answer isn’t seat time. Course material that is relevant to the student, delivered in age and experience appropriate lessons. Course design in the 50s stressed development of skills required for successful employment. Technology had minimized the apparent need for those skills. Thing is, developing those skills formed a solid foundation for advanced work. Just maybe the test needs work. Until we are blessed with the gift of Artificial Intelligence, humanity will have to stumble along. When Hasso was going to school all they taught was add/subtract/multiply/divide. The world has moved on. To Pooh-Pooh the teaching of contemporary mathematics is Trumpian in tone. Today’s Elementary students will be colonizing Mars. It’s gonna take some math. Oh My Gawd! Congruent with this and not with that!!! Someone I met from Colorado who has moved here said this state is tax-starved!! That’s right. We have to face it that without a sales tax (hopefully a well-crafted one that doesn’t tax groceries), we cannot keep this state going. The property taxes that home-owners pay are sky-high and they still can’t cover all expenses of the state….which heavily involves money for education. And our pie-in-the-sky, PERS pension for school teachers and employee and government workers, set up during a stock market boom in the last century, is bankrupting us. If only 33% of 11th grade students pass this test statewide, it seems likely that both the test and the teaching of the subject need work. As it is, my sympathy lies with the students, as matrices were my undoing in College Algebra after I had excelled at all levels of high school math in the 50’s-60’s. As for the PERS pension comment: let us remember that teachers (and others, I guess) were promised these pensions in lieu of pay increases that were due them in those long ago days. Somehow, administrators believed there would be money available to pay future benefits when that money was not available at the time of the promise. I guess many feel it is better to bankrupt those who taught school with the expectation that at least they might have a comfortable retirement, than to bankrupt the state in the present. My sympathies lie with the retirees who depend on PERS, since the situation affects me directly! Bring on the sales tax! One of the dumbest comments of all time. Nobody promised any state retiree a pension higher than his final salary. School administrators had nothing to do with payong excessive pensions other than being the lucky beneficiaries. If PERS was a private pension plan it would have been seized by the feds and hair cut to the asset value and the pension board who violated their fiduciary duties would have serious legal problems. Without the more than 300000 retirees plus spouses plus current members the democrats could not win an election. “When I think on all the crap I learned in High School, it’s a wonder I can think at all”. Paul Simon. Kodachrome. I use that quote all the time. I heard it years ago and never forgot it….never will. It expresses a great truth. I’m in my late seventies now and I still can’t see the use in most of the stuff taught in schools. Certainly not in these goofy math tests. By the time I was a senior in high school (go Bulldogs), I had most of my “required” classes done, so I had to fill the time with “electives” (they wouldn’t let me leave school). It turns out that one of the most valuable classes I ever took was a typing class (an elective!). Me and a couple other guys in a whole room full of girls. To my great surprise, that class has served me as well as anything over the years. And don’t get me started on “penmanship”. I nearly flunked a bunch of classes and suffered greatly because of lousy penmanship. Then I graduated and found out that big bad world out there don’t give a rip about “penmanship”. When ever I hear about how Oregon schools are at the bottom of the barrel – it don’t bother me in the least. They ain’t teaching those kids anything they can use in life anyway. Well…..mebbe they are….I understand they have classes in “keyboarding” now. Girls got home ec and typing because that’s where they were pointed. Boys got shop. When the lords of education saw that most children went to work by 8th grade, part of the high school curriculum got moved down to “junior high”.